Who would strap a bomb to his chest, walk into a crowded subway station and blow himself up? Only by examining how a terrorist understands his own identity and actions can this question be answered. The authors of The Terrorist Identity explore how the notion of self-concept combined with membership in terrorist and extremist groups, can shape and sustain the identity of a terrorist as well as their subsequent justification for violence and the legitimacy of their actions. The book provides an understanding of identity that draws on concepts from psychology, criminology, and sociology. Notably, the book examines several case studies of various terrorist groups, including: the Provisional Irish Republican Army, Hamas, the Shining Path, the Liberation Tigers of Tamil Eelam, and racist Skinheads. By making the construct of identity central to this analysis The Terrorist Identity explains how violent and extremist collective behavior emerges culturally, how it informs the identity of group members socially, and how participants assume their place in these groups completely even at the expense of life-threatening harm to others or to themselves. 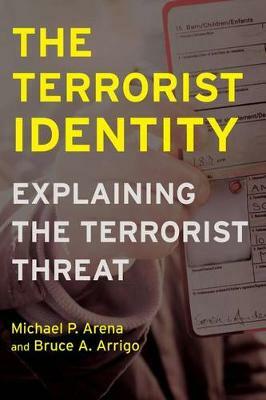 Buy The Terrorist Identity by Michael P. Arena from Australia's Online Independent Bookstore, Boomerang Books. Michael P. Arena is employed by a large state law enforcement agency where he works as an analyst and trainer. Bruce A. Arrigo is Professor of Crime, Law, and Society at the University of North Carolina at Charlotte. He is the author or editor of numerous books, most recently, Criminal Behavior: A Systems Approach and Philosophy, Crime, and Criminology.